Lod is a Nord and Falkreath's resident blacksmith. His house is located on the southern part of town. He supports the Empire, but he often states his devotion to the former jarl, Dengeir of Stuhn, a supporter of the Stormcloaks. So it comes as no surprise that he'd rather see the war end, but he places his loyalty above his own wishes by smithing weapons and armor for the Legion, thus contributing towards the bloodshed, ironically. He'll ask you to look for a wandering dog during A Daedra's Best Friend. Lod starts off his day by waking up at 8am to start working at his forge. He tirelessly smiths weapons and armor for a solid twelve hours, and finally stops work at 8pm. He will then relax in his house for four hours before finally going to sleep at midnight. He sleeps for eight hours until 8am and repeats his schedule the following day. Lod wears a blacksmith's apron and a pair of shoes. He is equipped with an iron dagger, and carries the key to his house and a selection of common items and gold. He'll greet you by showing his devotion to Dengeir over the Empire: "Steel's good, but loyalty's better. I'm loyal to Dengeir first and the Empire second. ", then subsequently "Only a hearty soul travels the road these days. ", "The war bleeds Skyrim. It bleeds her dry and I think none of us are the better for it. ", "Men and women join the war, they travel far on these roads to spill each other's blood. ", and "Falkreath's warriors always return, one way or another." If you mention that Falkreath seems quiet, he'll assure you: "Only inside the gates. Much of Falkreath hold is wilderness and there's plenty of trouble to be had." If you remark that loyalty seems important to him, he'll elaborate: "I was Dengier's [sic] personal guard for years. I risked my hide more than once to protect him. Why would I do that? For money? Because I swore an oath? No, it was because he was a good man and a true friend. A true Nord places loyalty and honor above all else." He always ends the conversation accentuating his business: "See me at my forge if you need arms or armor. ", and "Good steel's worth every septim. Remember that." Even though Lod values his friendship with Dengeir, Dengeir distrusts him as his paranoia gets the best of him. He'll ask you to break into Lod's house to steal a letter as a radiant quest: "Last night I saw Lod the blacksmith writing a letter. Probably sending word to Solitude and General Tullius. Are you loyal to Skyrim? Break into Lod's house and get that letter." The letter contains no proof of any wrongdoings though, and Dengeir will only conlude: "He's not spying, but it's clear the Empire is making Lod smith up more swords and armor for them." If you've reached level 10, you can start the quest A Daedra's Best Friend. If you approach a gate guard, they will walk up to you and ask you if you've seen a dog. Whichever response you give, they'll mention: "The blacksmith is offering a reward for a dog he saw on the road." Lod will ask you upon greeting: "Did you see a hound on the road? A fine, strong creature that's been wandering near town." You can choose between three replies. If you say you haven't seen a dog, he'll claim: "There's one out on the road. "; if you say the guard mentioned it, he'll add: "I asked the gate guards to look for him. "; or if you mention you've seen a whole pack of dogs, he'll retort: "No, no, this one's alone on the road outside of town." He'll always continue with: "I can't afford to chase him down but I could use a fierce, loyal beast to keep me company." You are then presented with two options, but you can just walk away, to which he'll add: "If you were willing to retrieve him for me I'd give you some fresh meat to attract him out on the road." If you tell him you can catch the dog, he'll be glad: "Good! There's some gold in it for you if you succeed. Here's the meat - check the road just outside of town." 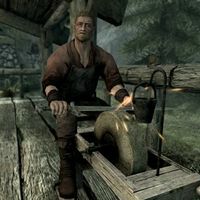 You can also try to persuade him to pay you first, which will always succeed and grants you 25 septims: "It's a smart man that demands something up front for his work. Some gold now and some when I have my dog. Here's the meat." He'll hand you a piece of fresh meat, though you won't actually need it during the quest. After finding out the dog is actually Barbas, you can return to Lod and remind him of his request with "You know that dog on the road you asked me to get? ", to which he'll just reply: "Yeah." When you tell him the dog ended up being a lot more trouble than he was worth, he'll quickly dismiss the topic, but will reward you with 25 septims: "Anyway, it's done. Time to move on. Much obliged. Here. It's not much, but take it anyway." His reaction gives the impression he knew you weren't chasing after a normal dog. Lod frequently dies in dragon attacks on Falkreath. Keeping him alive is almost essential to becoming the Thane of Falkreath and mandatory if you wish to complete Clavicus Vile's Daedric quest. Lod is a part of three scenes, but all three take place in Dead Man's Drink, which he never visits. Two of these scenes also don't match his description and job, as he is implied to be a farmer living at "The Gentle Repose", and as he puts Dengeir in a bad light (although this may be jokingly). Lod: "Ah Tekla, you're a pretty little mouse." Lod: "Alright, but if you ever want to leave that old curmudgeon I've got plenty for you to do at Gentle Repose." Data in the Creation Kit states that he's a confidant of Solaf, rivals with Runil and Kust (apparently related to the unfinished quest), and that Gunnar Stone-Eye is his brother. You can't start the quest A Daedra's Best Friend if Lod died, but the objective to speak to him will still be added by the guards. It's not possible to invest in his shop. If killed, Lod's corpse may never disappear. Lod was supposed to be able to give you the Blacksmithing Tutorial, but he was left out of the quest condition formlist. This page was last modified on 25 July 2015, at 01:23.